Spiš Castle and its associated cultural monuments were inscribed on the UNESCO World Culture and Natural Heritage List in 1993 in Cartagena in Colombia as the world heritage on the basis of criterion (iv). At the 33rd ordinary session of the World Heritage Committee in Seville in Spain in 2009 this area was extended by the historic town centre of Levoča. At this meeting the original site name was also changed into Levoča, Spišský Hrad (Spiš Castle) and the Associated Cultural Monuments. Criterion (iv) means that Levoča, Spiš Castle and the associated cultural monuments of Spišské Podhradie, Spišská Kapitula, and Žehra constitute an outstanding example of development of individual urban typological medieval settlements that have not been preserved as a whole in this condition and typological representation anywhere else in the world. They were strongly bound to each other, they influenced but they never became one unit. The unspoilt preservation of these monumental units, which were typical of the medieval period, was one of the main reasons for their entry into the World Heritage List. This world heritage area is located in the east of Slovakia; it starts about 30 kilometres east of Poprad with Levoča town, continuing into the Podhradská basin bounded to the north by the Levoča Hills and to the east by the Branisko mountain massif. The slightly undulating basin has provided favourable conditions for human life since prehistoric times. This fact is proven by a single find of hominid effusion in Europe (around 1.2 million BCE). Archaeological finds in this area show continuous settlement by the Lower Palaeolithic. In the Upper Palaeolithic this location was one of the most important centres of economic life in the Spiš and Tatra regions. The settlement called Kacvinkel was located in the area where today may be found Košice Gate, part of the fortifications of Levoča town. Another settlement with the Romanesque Church of St Nicholas, located on the left side of the road from Levoča to Spišská Nová Ves. The geographical conditions of the Spiš region determined the routing of long-distance trade routes from the Mediterranean to Pannonia and the Baltic area. These routes are proven by archaeological finds from the Bronze Age. The dominant architecture feature of Spiš Castle represents a unique urban-landscape complex growing up from limestone cliff. It is one of the largest and most impressive medieval fortification complexes in Central Europe. Its oldest parts, dating back to the 12th century, were raised on an earlier settlement and prove that the hill was already inhabited by the 5th millennium BCE. At the beginning of our era there was a fortified Celtic settlement. Some coins were discovered there – Biatecs of the Spiš type. At the end of the 11th century, as soon as the northern part of Slovakia was attached to the Hungarian Kingdom, the history of the castle itself began. By the 12th century the castle held an important position as the military, administrative and judicial centre of the newly-established Royal Comital. In this area there stood firstly a residential tower with the tank, but that probably collapsed. The first direct reference to Spiš Castle comes from Halíč-Volyn chronicles and dates back to 1214. In the early 13th century, when Andrew II’s son Koloman and later Queen Elizabeth resided in the castle, they built the donjon in place of a former residential tower. In its vicinity in around the 1260s they built a Romanesque palace. Then the defence tower arose as well and probably also the dyke with a moat from an earlier settlement of the castle hill. The stone fortification was built around 1221. After the Tartar invasion, which the castle had withstood, in 1241-1242 the Spiš provost built a barbican with palace, residential and entrance tower. Constructions aimed at strengthening the castle defence also call for attention. A military camp built on the south-western slope is also important. Part of the camp’s buildings was a fortification system, consisting of dykes and brick towers in combination with timber-and-earth fortification and a gate. The castle was royal; there dwelt Spiš zhupa counts with their court and armed forces. At the beginning of the 14th century, after the death of Andrew III (1301), the Arpád dynasty died out and fighting for the throne spread to Spiš. Charles Robert of Anjou won this fight after the battle of Rozgony. In this period, the old timber-and-earth system was replaced by stone walls. The fortification between the upper and lower barbican and the camp was completed, which actually meant that they were joined into a single functional unit. From the 15th century, Spiš Castle was the seat of influential Hungarian families – in the early 15th century it was Perinsky, then Berzeviczy and others. In 1464, Imrich Zápoľský became the hereditary Spiš zhupa count and owner of Spiš Castle. In that year, he together with his brother Stephen began a difficult reconstruction of the castle, transforming it into an opulent late Gothic fortified seat. The reconstruction of the castle at the end of the 15th century involved the reattachment of a large barbican on the south-western side to the castle complex. This was reflected in the repair and partial reconstruction of the walls, which continued to the16th century. In 1531 the Thurzo family acquired the castle and adapted it in the spirit of the Renaissance. They joined western palaces in the heart of the castle through the superstructure of a new storey into one unit and they also started to rebuild the constructions in the eastern part. In the spirit of those times they also modified the fortification system. In 1636 the Csáky family claimed their right to the castle because the Thurzo family died out in the male line. The Csáky family adapted the castle according to their needs and the style of those times. The largest changes were made to the acropolis. They significantly modified the eastern side of the courtyard by building a new economic wing. The Csáky family owned the castle until 1945. After the great fire in 1780 the castle slowly deteriorated. Only after the World War II did the restoration of the castle gradually begin. The world heritage site also includes the town Spišské Podhradie, located under the castle, whose history is inseparably linked with the castle. Spišské Podhradie is located between the castle and Spišská Kapitula (the Spiš Chapter). It was founded as a settlement around the castle and at the same time it was intended to be the settlement for the objects located west from the castle in the area of old Slavonic settlements. Its inhabitants were craftsmen and merchants who carried out various services for the castle. In the 12th century the town was colonised by German immigrants, which meant that soon it became independent from the castle. The oldest written documents referred to it as St Mary’s according to the patron saint of the first church from the mid 12th century. In 1321 the town is described as belonging to the community of Spiš Saxons. In the 15th century it flourished economically. From 1412 until 1770 it was under Polish administration. The town was located on a major trade route joining east with west and east with south – it was on the axis of trade routes from Levoča to Prešov and Spišské Vlachy and on the old Via Magna trade route. The centre was created by the Church of Blessed Virgin Mary and in the 15th century today‘s rectangular square was built around the parish church. After the riots associated with the Reformation, a synod was held in Spišské Podhradie in 1614, paving the way for Protestants for their separate administration in eastern Slovakia. The town had not lost its importance even in the following centuries, when it remained an important centre of the Podhradská basin despite devastating fires, floods and pestilence epidemics. Until today the town has retained the built-up area with typical Renaissance and Baroque burgher two-storey houses with semicircular gates. The peripheral parts retain their various ground objects, including the toll station and a synagogue from the late 19th century. While the Castle was the seat of secular governance, Spišská Kapitula (Chapter of Spiš) represented the seat of church administration – already a counterpart to the castle in the Roman period. Spiš provosts, bishops and canons organised church life from here. Spišská Kapitula is located west of the centre of Spišské Podhradie and it is its administrative unit. The first mention of it dates back to the 11th century. The provost diocese started its activity in the 12th century in the premises of the castle, but already in the 13th century it was relocated to the Chapter. Tartar hordes destroyed the Chapter – but this in turn caused lively building activities. In 1245 the construction of the Cathedral of St Martin began, and a few years later the construction of the provosts’ palace. Several raids at the end of the 13th century necessitated the construction of fortifications. The three-aisled Cathedral of St Martin itself is a gem of Romanesque and Gothic architecture, and so is its richly preserved furniture. A narrow street with houses of canons between the Lower and Upper Gate arose there. Each house had a yard, large garden and rear farm buildings. The building design has not essentially changed since the 14th century. In the 17th century the monastery complex was built and the provosts’ palace and fortifications were completed. The Baroque Clock Tower dates back to 1739. The Church of the Holy Spirit at Žehra is located in the village of Žehra, south from the castle. It was built between 1245 and 1275. It is an early Gothic church with a rectangular seal of the presbytery and a pre-built tower. Later it was vaulted to the central pillar. The church is unique due to its rare medieval murals of five periods dating from the end of the 13th century to the 15th century. The most famous fresco scene is one dating from the end of the 14th century, The Tree of Life (Arbor Vitae). The altars and pulpits are Baroque; the baptismal font comes from the Romanesque period. This whole unique urban series is emotionally linked to the surrounding countryside, carrying the traces of the distant past and supplemented by natural travertine Dreveník massif, which together with the Church creates a unique compositional complex. The territory of the town of Levoča was inhabited from the Late Stone Age. It is mentioned in written documents for the first time by Leuch in 1249 and soon after that in 1271 it had already became the capital of the Community of Spiš Saxons. In 1321 Levoča received the privilege ‘right of store’ and in 1323 it became a free royal town. The medieval ground plan of the town was founded by colonists in the 13th and 14th century and partially incorporated the pre-urban settlement of Katzwinckel, close to the Košice Gate, whose lenticular square became part of the main commercial artery. At its heart was a generously spread rectangular market square with a total area of 4.4 hectares. The main long-distance road passed through the square. The street network of the city was created, which is essentially regular and respects terrain features. Road set blocks still surround the square from all sides in two and in the eastern side three rows. The generous plan of the medieval town is uniquely preserved in its original scope. The ground plan of the town was adapted to natural conditions, because the town was built on a hill, protected from the north and the west by high cliffs. A unique urban diction of the medieval square, surrounded by noble burghers’ houses in remarkable symbiosis with simple or even rural built-up areas of other streets, has been maintained until today. As soon as Levoča was established, it had an irreplaceable place as a centre of economic and business life due to its position at the crossroads of trade routes and was also a political, military, management-administrative, cultural-artistic and educational centre as well as a place of pilgrimage. All these facts had a strong influence on the rapid economic expansion of the town and they are reflected in the medieval urban structure preserved until today, which is closed by sophisticated system of walls with town gates and fortification elements. It is likely that the beginning of the construction of still preserved walls and also the first phase of town fortifications date back to the first half of the 14th century, when the urban plan of the town was set. In this period the construction of the St Jacob‘s Church began in the centre of the town. The construction of the Minorite monastery was begun on the western side; its localisation in the peripheral part was strictly influenced by the laws of Minorites. Building development of fortification walls in the next period meant their expansion and modernisation. They also reflected the development of military technology. The advanced and complex fortification system of Levoča is a great example of medieval fortification architecture. 80 per cent of the fortification system with 16 bastions and three city gates – Košice, Menhardská and Polish Gate – has been preserved until these times. The evidence of the economic boom in the town during the Middle Ages is also reflected in the construction of houses of wealthy burghers around the rectangular square from the 14th to 15th centuries (which were later modified in the style of Renaissance). These burgher, patrician and craftsmen‘s houses create a system of unique architectures, which not only indicate the prosperity of the town in the Middle Ages and in the beginning of modern times, but also document rich contacts with developed cultural centres of Central Europe. The houses presented artistic decoration and craft details on the facade and in the interior. The main square, whose original main function was the marketplace, was gradually crowded by the central build-up of public buildings as ecclesiastical, administrative, economic, public and socio-cultural life thrived. In the middle of Master Paul’s Square there is the Parish Church of St Jacob, built in its present form in the mid 14th century. South from the church there stands the town hall, originally built in the 14th century and rebuilt in the 16th century. A massive evangelical church stands behind them today. The church was built in the first half of the 19th century. The town school, rebuilt in 1588, was on the north side of the church. Originally there was an urban weighing station and an armoury, but from the 19th century these were rebuilt into today’s town office building. In the mid 19th century the square area was enriched by two city parks, in the southern part there was a fountain and a cage of shame (pillory). A set of medieval building objects with original art and craft equipment has been preserved in Levoča. This set is the peak of Master Paul’s work. 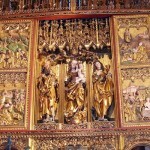 He is attributed with the creation of the highest Late Gothic wing altar in the world, located in Levoča‘s Parish Church of St Jacob. This monumental main altar, together with the altar of St Johns, documents in a unique way the style and opinion change of the end of the Middle Ages and incoming modern times. Works of Master Paul and his workshop belong to the most important elements of furniture, not only in Levoča‘s parish church, but also in several other medieval Spiš churches. Levoča town had a major impact on various fields of architecture, especially in Renaissance period, by establishing a ‘Spiš Renaissance’. The medieval heart of the town of Levoča is now protected as Levoča Town Conservation Reservation.